It's time to say Goodbye to November 2015. 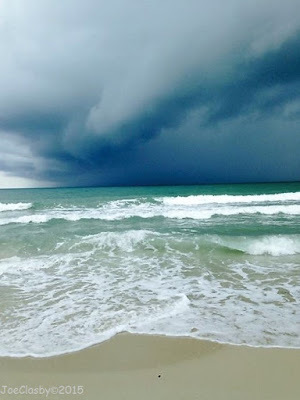 It's been a month during which Koh Samui was very much under the spell of the monsoon or the rainy season. 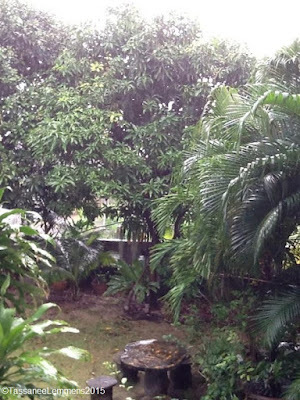 It rained almost non stop all month long, there were not that many days during which there was no rain. Hopefully the ground water reservoirs have been stocked up again, so during the coming drier season, there will be enough water to deal with the ever increasing demand. 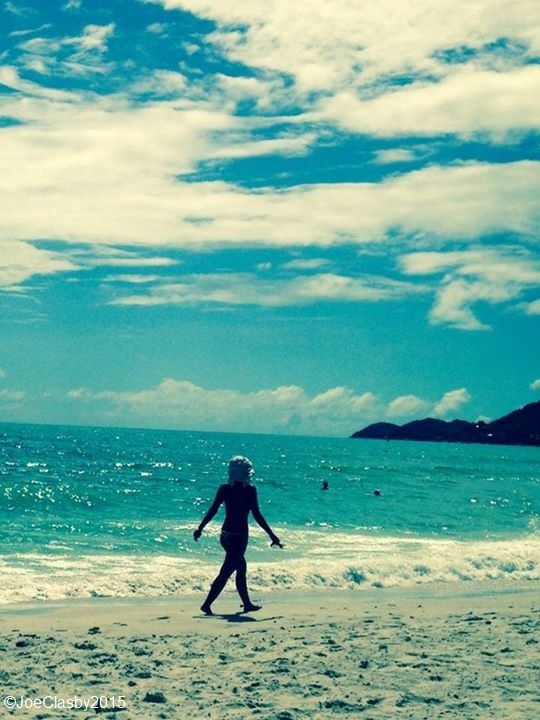 This November was like how a typical Koh Samui November should be, with lots of rain and the occasional flash flood. Due to the new drainage system around the island, the flash floods don't turn in to two day or two week floods anymore but typically are gone within a maximum of two hours and most of the time even faster. For me personally it was a busy month with lots of work outside of Koh Samui, first I conducted a PADI IDC in Khao Lak and currently I'm doing the same in Moalboal in the Philippines. I'm on the last day of the IDC course here, with the PADI IE and Instructor Specialty training still coming up. This month I also managed to get a lot of running done, with the first three weekends of the month being filled with races, one half marathon in Surat Thani and two 10km races on Phuket on consecutive weekends. It's time to close this month now and look forward to the next and also the last month of this year, December 2015. 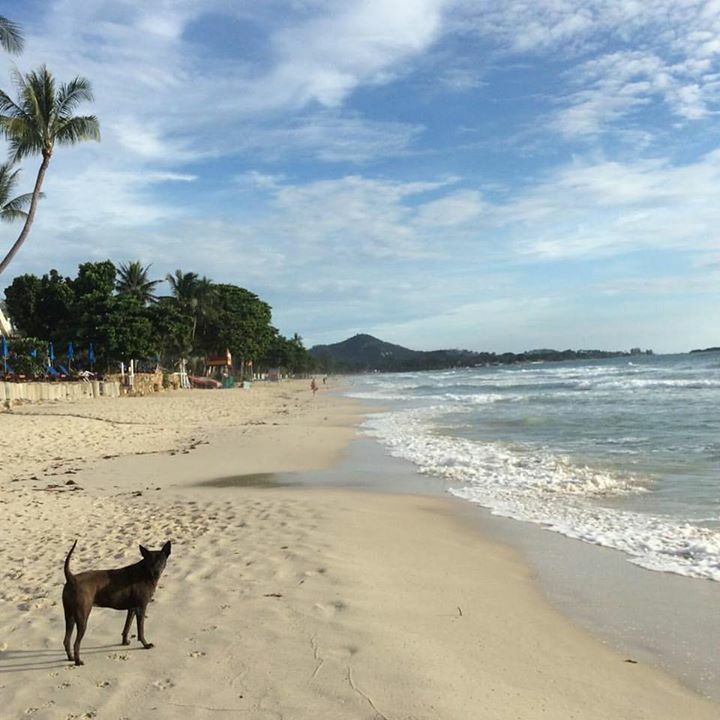 Midway through the month I should be back home again, to enjoy the festive season surrounded by my family and the familiar shores of Koh Samui! Thanks for checking in this month and I'm looking forward to seeing you all next month again! The forecast predicts cloudy skies for Wednesday and Thursday but other days should have sunshine although rain may be expected on each day, varying from light rain to tropical showers. The rainy season has not yet left yet! It's been a while since I posted on the Food on Wheels series, but we're back again with a new blog; Food on Wheels; Deepfried goodies at Panagsama Beach in the Philippines, which is near Moalboal. The lack of new updates is mostly due to the fact that it becomes more difficult to find original and/or new ideas on how to use the food on wheels option. 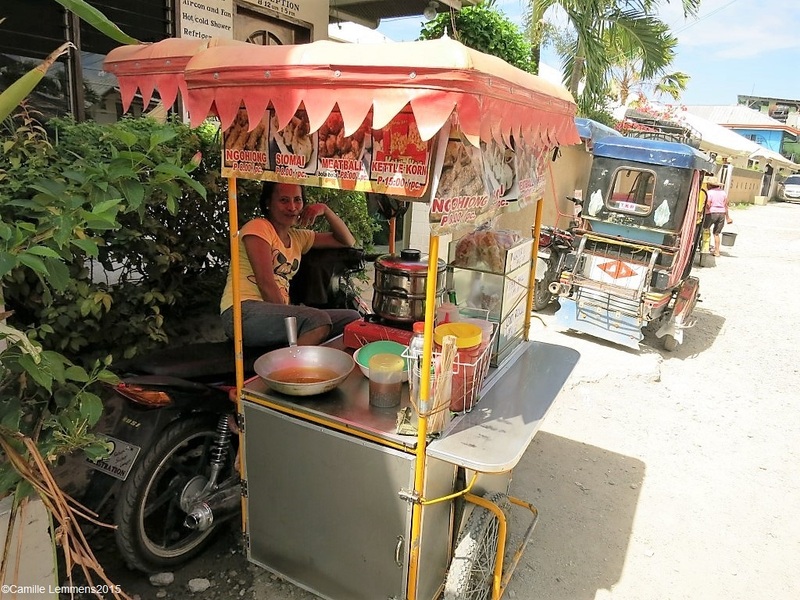 It's easy to post every month the same pictures over and over again, from a fruit seller for instance on his motorbike, but I rather look for something new or refreshing. 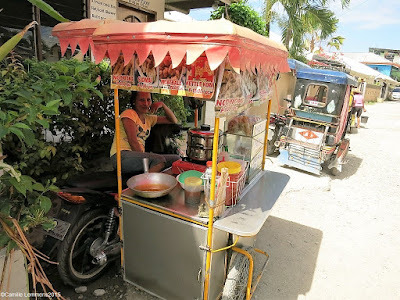 This post is possibly not exactly the most refreshing or original Food on Wheels option out here in South East Asia, but it's the first deep frying sales person I see in the Philippines, hence, it was time to take pictures and post here. There are only 4 or 5 things for sale, all deep fried and they are cheap as well, 8.-PHP per piece. Not very healthy and not my choice (anymore) but she seemed to be doing good business. 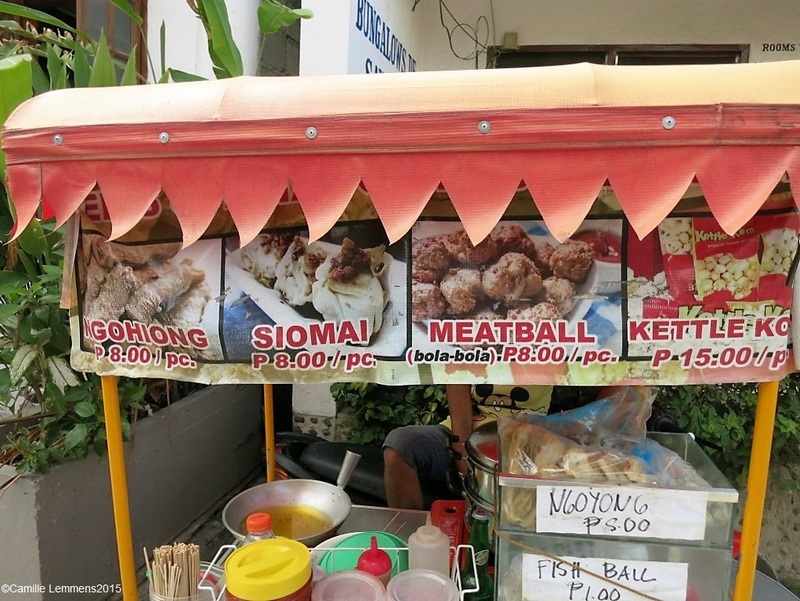 Ngohiong and siomai are on the menu! 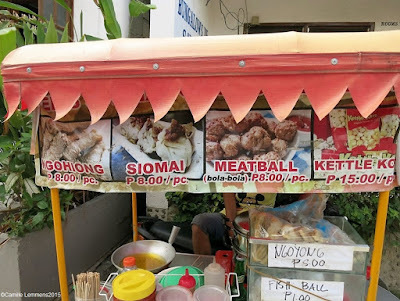 The few options are also new to me, ngohiong is a coconut based kind of spring roll and the siomia is very garlicy, a steamed pork dumpling (pretty well known all around South East Asia). the meatballs speak for itself, just as the korn. Fish dumplings can also be ordered. 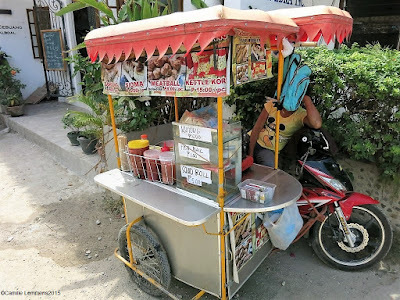 It makes me happy that I can continue with the Food on Wheels series again and I hope you enjoyed this entry and when in the Philippines, try this stuff out! The forecast heavy rain for today and rain into the late morning tomorrow, after which it should ease up with the clouds and we may enjoy some sunshine in exchange with cloudy moments and some showers. A mixed bag kinda week to come and still very much good old fashioned rainy season weather. The forecast predicts a stiff wind for tomorrow with plenty of rain but after the weekend it should clear up and we may have a couple of dry and sunnier days before next weekend becomes windy and wet again. The forecast is predicting wind and rain over the weekend, as part of the storm hitting Thailand and most of the Southern Gulf region in Thailand. After the weekend the sky should start to clear up and we may have sunny days mixed with some rain showers. 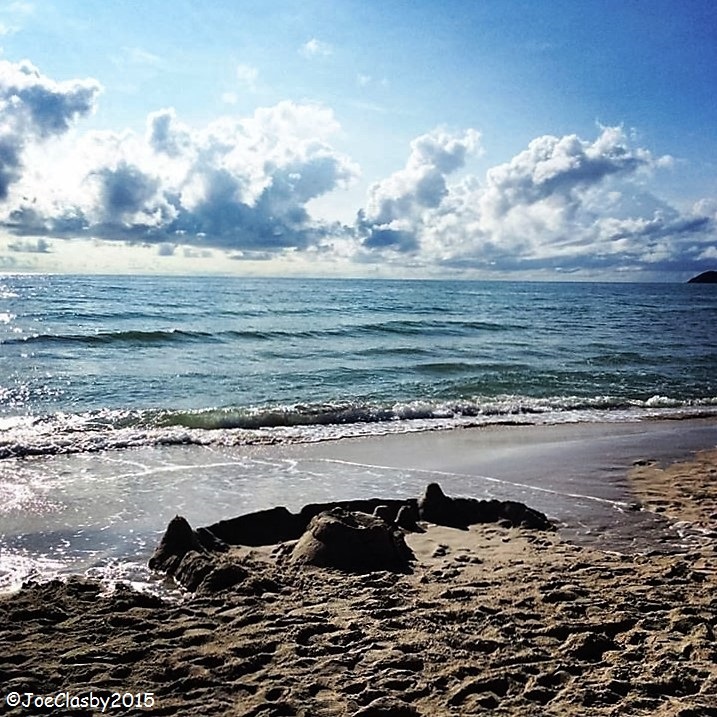 The early morning sky over Koh Samui is looking very nice with plenty of blue and the sun being out and about, this in total contrast to the weather forecast. Current temp at 7am is 27C with possibly some rain showers during the afternoon. 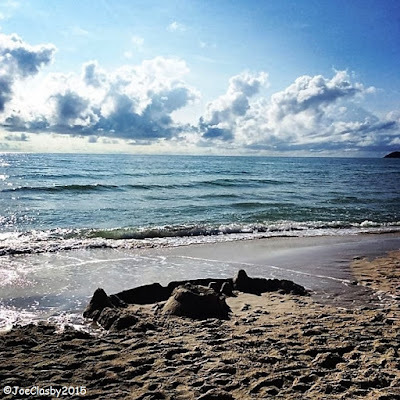 The forecast is looking good, although a weather warning has been issued by the Thai Meteorological Department for among others Surat Thani province, it's looking rather nice with the sun being out and about until the weekend. The predicted strong weekend storm has almost disappeared though and we just see a faint wind and a fair amount of rain that is to be expected. After the weekend it may become very nice with plenty of sunshine and an occasional shower. Today is Loy Kratong 2015 ลอยกระทง around Thailand and it's one of the biggest Buddhist events around the country. The name can be translated as "to float a basket", and comes from the tradition of making a krathong or rather a buoyant and decorated basket, which are then floated on a river, a lake or on Koh Samui, into the ocean. A 'loi' (ลอย) means "to float", while krathong (กระทง) has various meanings, one of which is "a basket to be floated on water in the Loi Krathong festival". Several translations of krathong can be found, such as "floating crown", "floating boat" or "floating decoration". The traditional krathong are made from a slice of the trunk of a banana tree or a spider lily plant. Modern krathongs are more often made of bread or Styrofoam. The advantage with bread is that it will disintegrate and can be eaten by fish. Styrofaom is a different problem altogether. The Loy Kratong event takes place on the evening of the full moon of the 12th month in the traditional Thai lunar calendar. In the Western calendar this usually falls in November. This year it's today, next year it will be 15th November 2016. This is one of the few Loy Kratong celebrations during which I'm outside of the country. I've been in Khao Lak a few times during Loy Kratong, so I cloud participate in and enjoy the general local festivities. However, this year I find myself back in the Philippines, and being a Catholic country, there's no Loy Kratong to be found here. 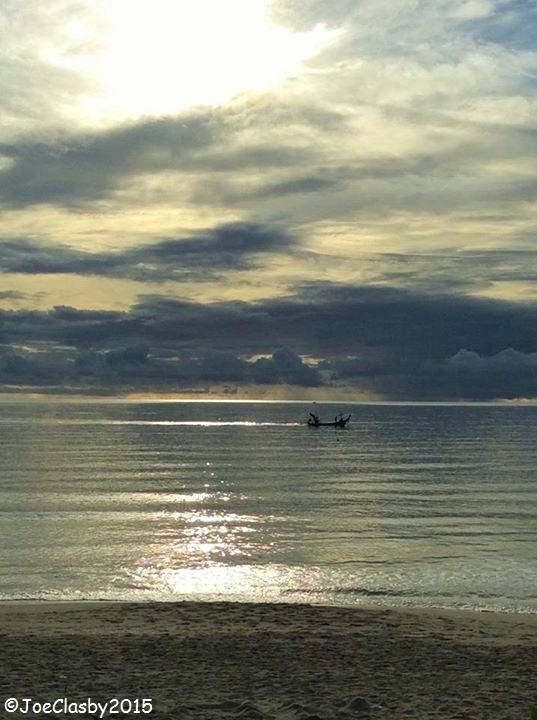 It's always a great event to witness and if you're on Koh Samui today, enjoy your Loy Kratong 2015 event. 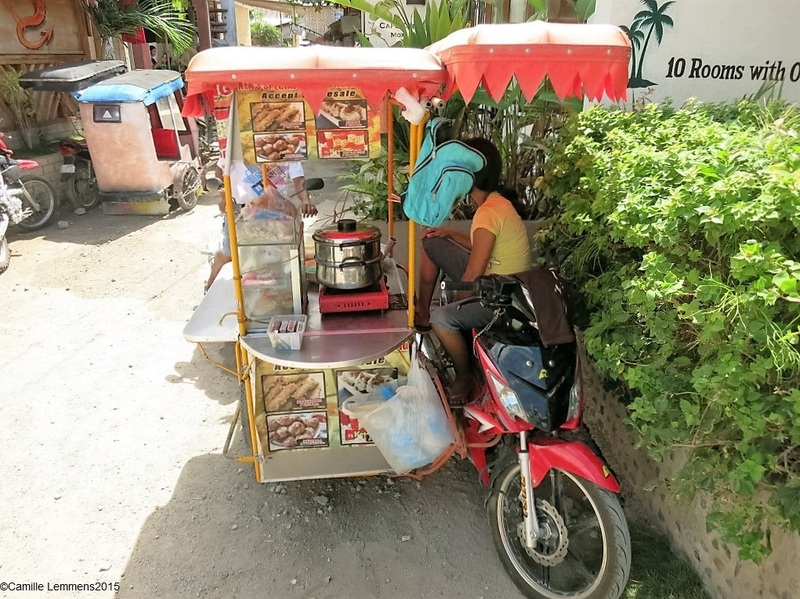 The best place (and most busy one as well) will probably be at Chaweng Lake or Phru Chaweng. Some of the temples around the island may also have activities planned. Be prepared for heavy traffic and parking problems. I do hope you enjoy your Loy Kratong 2015 event, where ever you are in Thailand. Today is Loy Kratong in Thailand, a big Buddhist celebration and an event that has the whole population involved around the country, floating their 'Kratongs'. The forecast predicts fairly sunny days for the next two days but do expect some small showers and a stormy Saturday with strong wind and lots of rain, to ease down next week with cloudy skies and daily showers. The forecast for Koh Samui is looking like there are a cloudy ten days are ahead of us, with plenty of rain and especially over the coming weekend there will be a big storm with lots of rain coming in. After the weekend it may ease up again, the wind will be mostly gone but some of the rain might stay. The forecast cloudy days ahead of us with not so much rain anticipated for tomorrow and Wednesday but picking up on Thursday with wind and rain and culminating in a real storm with strong wind and lots of rain over Saturday and Sunday and easing off towards mid next week, when the sun may pop out again. The forecast predicts a nice and sunny day today with clouds and showers moving in as of tomorrow again, with a strange storm like day this coming Sunday, in a week's time. The forecast predicts rain until Tuesday and a storm over next weekend. This evening I will fly to Bangkok and with a night flight I will arrive early morning in Manila in the Philippines and continue with a flight to Cebu, where a taxi is waiting for me and we will move on to Moalboal. A long travel day ahead of me! The forecast is showing sunny skies until Sunday after which the clouds move in again and more rain can be expected. Next weekend should see more wind and stronger rain showers around the island. This is turning in to an old fashioned rainy season. It's good to be back home again, although it's only for two days, tomorrow evening I'm off to Moalboal in the Philippines, via Bangkok and Manila. 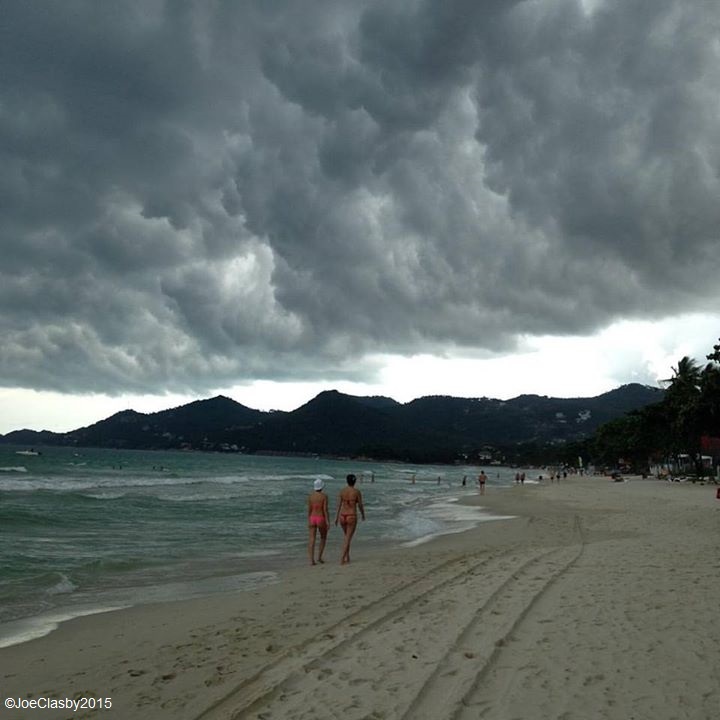 The forecast predicts the next three days to be dry, with lots of overcast on Sunday, Monday the rain returns and come Friday, a real storm with strong winds might visit Samui. The rainy season this year is far from over. 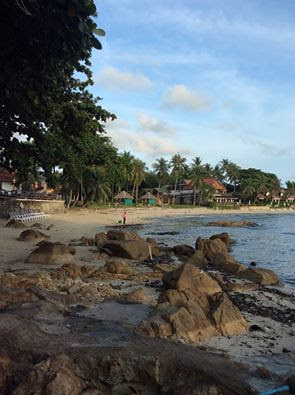 Within half an hour I will leave Khao Lak and I will be on my back home to Koh Samui, where I will leave again come Friday evening, for a PADI IDC in Moalboal in the Philippines. Yesterday saw a pleasant and sunny day around Koh Samui with a max temp of 32C but last night there was a lot of thunder and lightning going on and it may have rained in parts of the island. The forecast predicts rain for tonight and tomorrow morning after which you can expect a mixed bag of sunny moments followed by rain followed by sunny moments followed by rain etc. Yesterday saw a nice and dry day around Koh Samui, with plenty of sunshine and a max temp of 33C. It's a been a while since Samui had these kind of temperatures. 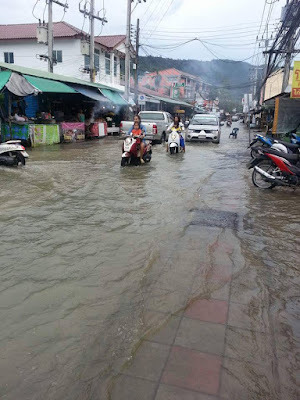 The forecast predicts that the rain will return to Samui until Saturday, from Sunday through to Wednesday it should be dry again and more rain after that. Yesterday afternoon and evening we had some very hard rain here though. The forecast predicts today and tomorrow to be sunny with some rain and clouds moving in again come Wednesday, It looks like there will be still plenty of sunshine available and not as much rain is expected or rather predicted as we just had during the last two weeks. The reason why this update is so late, is that I was on Phuket this morning, running the 12th Prince of Songkla Uni 'Child Watch Phuket' race over 9km. Two years ago I already participated in this race. It was a fast race, I ran 8.71km in 40'48 or with a 4'41 pace, which is fast for me. Still no placing in my age category. 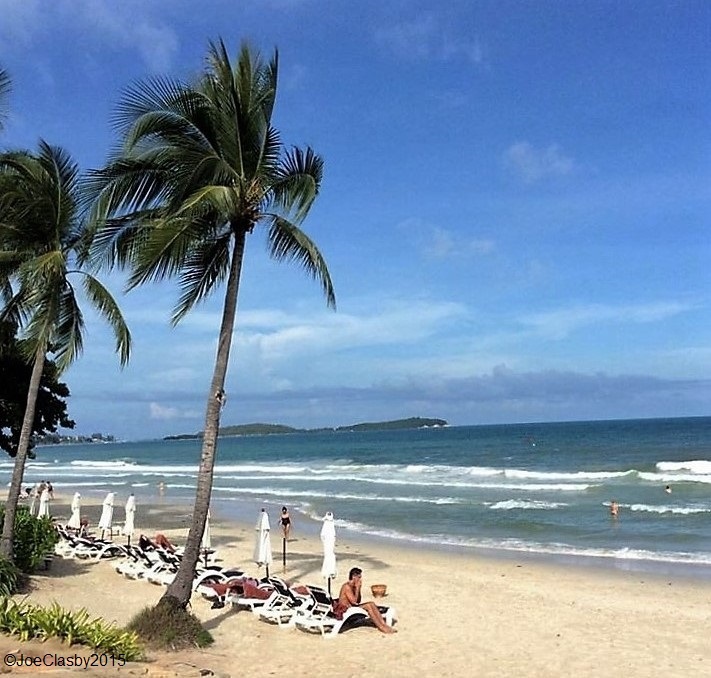 The forecast is looking good for Koh Samui with mostly sunny skies except possibly some rain come Wednesday and next Friday and Saturday. Flash flood at the market in Chaweng, that is located between the Laemdin market and the ring road. They happen due to long and prolonged hard rain time, so the sewer system gets overwhelmed and can't deal with the amount of water anymore. These flash floods normally recede after a couple of hours. The forecast is looking nice, until Wednesday there should be hardly any rain, except possibly for Monday and plenty of sunshine, with some heavy rain predicted for Friday and lighter rain for Saturday and a sunny Sunday next weekend. Let's see if this prediction will hold out! In Khao Lak, the PADI IE is about to start for my current PADI IDC candidates, so for today and tomorrow they will be busy! We also have a partially cloudy sky with big blue and sunny patches in it. Current temp at 7am is 25C and since two day's it has been dry again! The forecast is looking good for the next couple of days, until Wednesday there should be hardly any rain and plenty of sunshine. After Wednesday it still may b sunny but you may expect also some showers again. 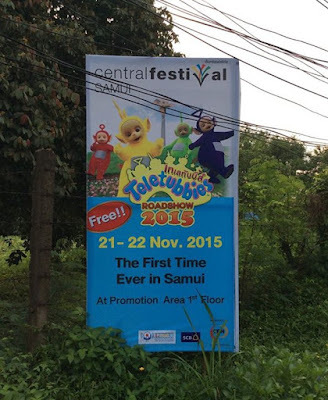 A bit late possibly, but the Teletubbies are visiting Koh Samui 21-22 November at Central Festival. In general thought to be an event for children, but maybe some grown ups would like to attend as well and have a trip down memory lane. It's the first time they visit Samui with a road show. Although I don't know what to expect, I assume it will be a great event for children nonetheless. Anyone for tennis at 'The Sands' resort in Khao Lak? 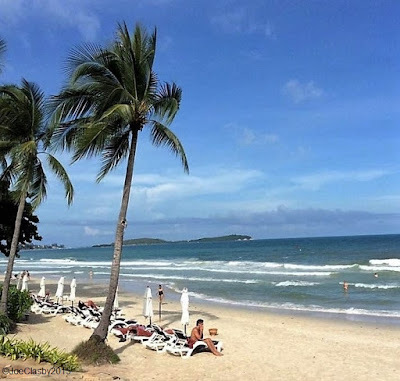 The forecast fr Koh Samui predicts clouds and rain until Saturday, followed by a sunnier period between Sunday and Thursday, when the clouds and rain move in again. The wind is not that much of a factor, there is sometimes a little of wind but no strong storms or the like are in sight at the moment, just plenty of rain. The rainy season is in full swing! The forecast keeps changing from day to day, now it's back to cloudy and rain until Saturday, after which it turns into less cloudy with maybe some sunshine and rain. The rainy season is still here but it's not that bad. The forecast has changed ever so slightly again and except for Sunday and Monday, when heavy cloud layers are expected, all other days in the next ten days, should have sunshine and a chance of tropical showers, but less rain compared to yesterday's ten day forecast. 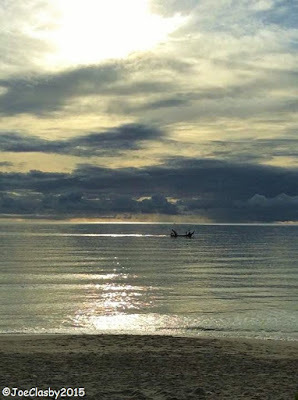 Yesterday saw a lovely morning around Koh Samui with plenty of sunshine. Later during the afternoon and evening there was rain again. The forecast has changed slightly and now we have more clouds and a bit of rain again in the cards until Sunday. On Sunday it may clear up again with less clouds, more sunshine and less rain. This morning I ran a 12km race in Tambon Sisunthon on Phuket in 1:01'01, with a 4'53 pace, which for my doing is pretty fast. It's also partially cloudy here at current temp at 8.30am is 27.2C. 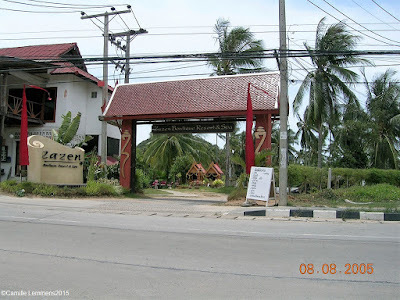 Once I'm done here I will be on my to Khao Lak again to continue with the current November PADI IDC. The forecast is still looking good for the next ten days, partially cloudy skies with sunshine and occasionally a tropical shower. Well above average for a typical November day, so enjoy while it lasts!